Over the next two years every park, pool, rec center, cultural facility, sports field, and trail in the Austin will have recycling everywhere they have trash bins. In a community with as many outdoors enthusiasts as Austin this is a crucial step towards ensuring diversion opportunities everywhere we live, work, and play. This victory is the fruit of many years of work by TCE Fund and our allies, including a generous grant from the Patagonia Foundation. How did we win? Public pressure and persistence. Here’s how we did it. The roots of the parks recycling effort go all the way back to the last decade when TCE Fund led the effort to commit the City of Austin to Zero Waste. This is “a goal that is ethical, economical, efficient and visionary, to guide people in changing their lifestyles and practices to emulate sustainable natural cycles, where all discarded materials are designed to become resources for others to use,” according to the Zero Waste International Alliance. It means a commitment to “not bury or burn” our discards. Zero Waste—which is defined as reducing 90% of waste sent to landfills or incinerators—is possible because most of what we throw away can be recycled, and most of what’s left can be composted. Most of the fraction that’s left could be eliminated, especially if the companies that make it had to take it back. There is only one thing standing between our communities and Zero Waste: political will. By securing an ambitious Zero Waste goal of 90% diversion by 2040, we got the political leadership of Austin to put their will towards keeping materials out of the trash. This policy has been the foundation for many TCE Fund accomplishments since then, including universal recycling for all residents and businesses, curbside composting, Austin’s single-use bag ordinance (since pre-empted by the Texas Supreme Court), and a visionary Construction and Demolition debris ordinance. Unfortunately one of the easiest pieces in the plan was skipped over when the City of Austin failed to meet one of its commitments: to lead by example. This means making City government operations Zero Waste as quickly as possible. Almost seven years after the Austin Zero Waste Plan was first adopted, the City is still throwing away valuable recyclables and compostable materials. TCE Fund made a decision to hold them accountable on the most public-facing department of all, Parks and Recreation. 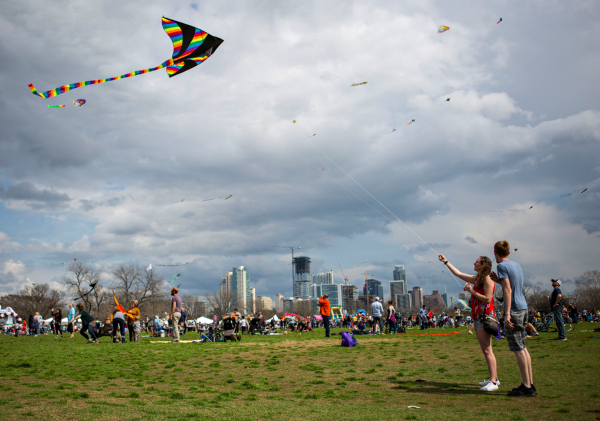 Austin has 300 parks and dozens of other facilities maintained by the Parks and Recreation Department. 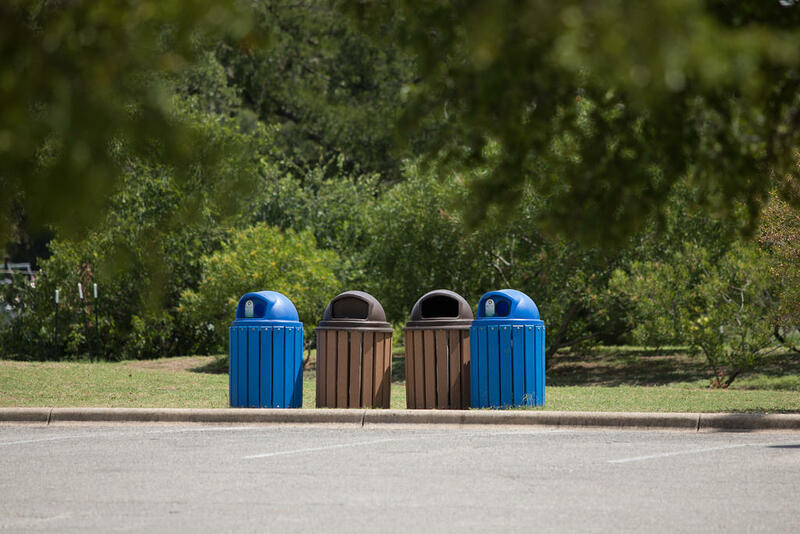 Millions of people visit Austin parks facilities every year, and in almost none of them could they have found a recycling container before our efforts began. Now they will find them everywhere. When we began this effort more than four years ago City of Austin staff were very hesitant. We pushed back and got city commissions to demand recycling at all parks. Over time their hesitancy gave way to acceptance and then enthusiasm. Today the Austin Parks and Recreation Department is a key ally in this effort, and worked closely with TCE Fund and our allies—especially the Austin Parks Foundation—on developing the policy options for bringing recycling to all parks. Previous TCE Fund efforts had prompted the Parks and Recreation Department to launch a pilot program, but still only 7 out of 300 parks had any recycling. They needed more money to get the rest, and when it comes to the Austin city budget in general, there are far more needs than money. So we worked with Austin Parks Foundation and recycling advocates on the Zero Waste Advisory Commission (ZWAC) to secure an authorization from the City Council for a special task force on parks recycling. We had less than two months to craft a proposal that could show the City Council how to pay for parks recycling without taking money from other important programs. In the end we came up with a menu of good options, and won unanimous support for them from the Zero Waste Advisory Committee and the Parks Board. TCE Fund, Austin Parks Foundation, the respective commissioners and board members then began talking with members of the Austin City Council about why recycling in parks was so important and the simple ways they could fund it in a fiscally responsible manner. There was a great deal of concern about competing priorities and affordability impacts, but we demonstrated how this goal could be reached with minimal costs to taxpayers and ratepayers. At the same time, our canvass teams organized grassroots support in every corner of the city, especially the districts of possible swing votes, to get constituents to write letters to and call their City Council members to demand parks recycling. Thousands of people reached out, and the impact was real—by the time the votes on the budget were held, City Council knew this was something that had to get done. Throughout this process we had a vital ally in City Council member Leslie Pool, from District 7 in North Austin. Council member Pool made parks recycling her top priority, and her staff stayed creative and committed when seeking ways to make it happen. In the end they found a way nobody had anticipated: using a somewhat obscure debt mechanism called contractual obligations (called KOs to distinguish from COs, certificates of obligation, a different kind of local debt). They secured the full $1.8 million for recycling container purchases and installation with this tool, and it will be paid off over a long period at low interest rates, meaning it will have very little budgetary impact over time. We got more than we expected! Now we are watching closely to see just how the City implements this program. We know we have good allies in the Parks and Recreation Department, and ongoing leadership from the Austin Resource Recovery Department. It will take a little time to purchase the containers and finish plans on where exactly to put them and how to collect them, but we are mere months away from fulfilling a crucial part of our Zero Waste vision. A grateful thanks again to Austin Parks Foundation, Council member Pool, as well as Parks Board Commissioners Rick Cofer, Randy Mann, and Dawn Lewis, ZWAC Commissioners Kaiba White and Amanda Masino, as well as staff from Parks and Recreation and Austin Resource Recovery. Most importantly thank you to YOU, as a TCE Fund supporter for carrying us to victory. It’s the voices of thousands of Austin residents and your ongoing support that makes it possible for us to win these kinds of fights. This is YOUR victory. Thanks for making it possible, and when you see the blue recycling bins in your local park soon make sure to tell people “I did that.” We’re honored to have helped you make it happen!